The value of a map lays in its ability to deliver heaps of information to the user with just a glance: Distance, terrain, points of interest, population density and what the surrounding countryside is like. The American Red Cross is making use of very advanced types of maps, called WebMAPs, in its response to Hurricanes Harvey and Irma. A WebMAP, based on a format called ARCGIS (GIS standing for Graphic Information System), can take the masses of statistical data the responses are generating and turn it into a readily grasped visual display. That, in turn, leads to faster, more effective planning and decision-making by the incident managers on the scene. How that works in practice is explained by Amanda Appel who is on virtual deployment to Harvey, from her full-time Red Cross post in Wenatchee, Washington. In her regular job she is Direct Services Specialist for the Northwest Region, covering Washington and the Idaho panhandle. Now she is on virtual deployment as a Map Writer–deeply involved in the Red Cross’s Harvey response without ever leaving her home office. On one recent evening, at around 11 p.m., PDT, she received data from the Red Cross national headquarters in Washington D.C. on kitchens in use in the storm zone: where the kitchens were, their capacity, how many meals each served in the past 24 hours and how many meals each planned to serve in the next 24 hours. Appel’s job was to take all that data and using the ARCGIS format, turn it into a WebMAP–taking mind-numbing numbers and making them come visually alive. Seeing the data in map form would make it easier for managers on the ground to make crucial decisions on feeding refugees from the storm. It took her about 30 minutes to complete the map. 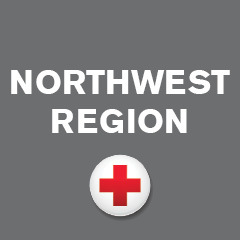 By 11:30 p.m. Wenatchee time (2:30 a.m. Washington time) the finished map was on the way back to Red Cross headquarters –ready to be put to use when incident managers reported for work early that morning. The Red Cross is rolling out the mapping system across the country, under the function name RC View–using it wherever decision-making can be enhanced by bringing data to life. One example, Appel says, would be a map showing the response to house fires in an area, with an overlay showing where the Red Cross has installed smoke alarms. If responses to house fires are shown to be down in an area where lots of smoke alarms are in place, then the smoke alarm campaign has been properly carried out. The Northwest Region has only been making use of mapping in the past year. Appel got her training as a Map Writer in a two-day course last April, taught by Red Cross trainers from Chicago and San Diego. Once mapping has been introduced to a chapter and Map Writers trained, it can be used to improve decision-making in almost every function the Red Cross carries out–from sheltering disaster victims to managing call centers. Beyond data the Red Cross generates, says Appel, mapping can make use of information from such agencies as the National Oceanic and Atmospheric Administration (NOAA). Data from NOAA, says Apple, might help the Red Cross map evacuation routes from disaster scenes. While Appel is deployed virtually this time, she has worked in disaster scenes many times. She was deployed twice to New York for hurricane Sandy in 2012 and to Wisconsin for flooding earlier in 2017. She came to the Red Cross fresh out of Central Washington University in 2011 as part of the government’s AmeriCorps community service program. Her two years in AmeriCorps convinced her the Red Cross was where she wanted to be. She was Disaster Program Manager from 2013 to last April and regional Direct Services Specialist since. Her present job involves working with all the Red Cross services that directly involve clients, such as mass care and client services. Any large-scale relief operation takes plenty of workers on the ground. But not all jobs need to be carried out at the disaster scene. Some, such as planning, finance, call centers, casework, dispatch, mapping–to name a few–can be carried out from afar. Appel is one of three Map Writers in the Northwest Region deployed virtually.